The demo release uses only 4/5 user selected symbols.Total number of characters of these symbols should not exceed 50. The demo release supports paper trading feature. Need to double click on B column for buy and S column for sell. It supports Odin extraction and Odin backfill also. 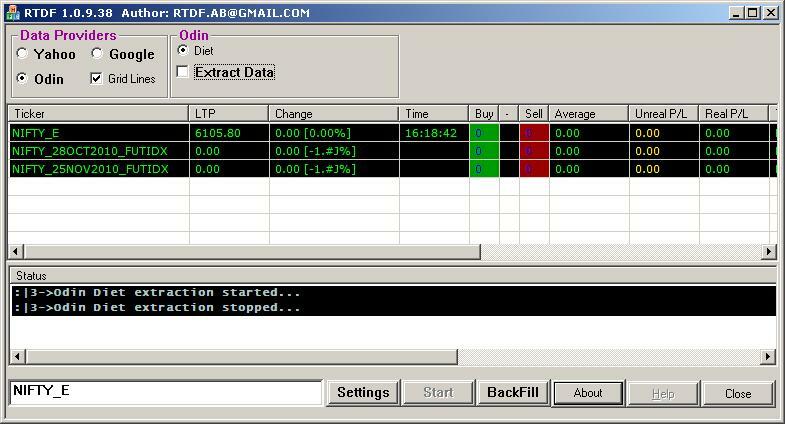 It supports odin auto trading also..
3)Unzip RTDF.zip to some folder in C Drive. 4)Copy rtdfy2g.ini to C:windows directory. Also Refer RTDF.chm or RTDF.htm for setting up RTDF. This is tested om WinXP SP2 and SP3 and Windows-7 Ultimate 32 bit editions. 1)Copy rtdfy2g.ini to C:windows directory. This file contains the mapping of yahoo symbols to equivalent google symbols. I have added only 6 symbols. User need to add the required symbols.This file is required when RTDF uses yahoo finance data provider and uses google backfill. 3)Open Amibroker with your existing database or with new database. 6)Select either yahoo or google data provider. 8)For back fill, press “BackFill” button and select the required data provider..
9)If you not get any updates in AmiBroker, please download and install Microsoft Script Control. Here is the link . Then repeat steps 1 to 4. 10)Enjoy trading with real time chart. Downloaded but file has some virus and trojan. Be Carefull while downloading and extracting file. Rajendran Sir please upoad file again. Thanks again for good info. @Ankit : File Upload is not entertained here due to security reasons. As of now only supporting image uploads. Let me check out the possibilities and will let you know. This updated version doesnot display “Winhttp error”..
How many day’s its working with RT ? Thx for the updated version but can you tell us how to connect it with amibroker to get live rates, as per its not getting connected with amibroker, kindly shoot a tutorial on how to connect it with amibroker I believe many people would be facing the same problems…..
am not able to download RTDF new version , plz help me to download.